One Silicon Valley start-up is making shoes from eucalyptus tree pulp. The Silicon Valley start-up Allbirds is making its name by making shoes out of eco-friendly materials. After the success of its woollen shoes, the company has developed a new textile by spinning eucalyptus tree pulp into a fiber and then knitting it into a mesh fabric. The insoles of the newly-launched skipper shoes are made from castor bean oil, the laces from 100% recycled polyester and even the eyelets are made from a bio-based plastic. While many people have never stopped to think about the green credentials of a pair of shoes, the scale of global sneaker sales means improved industry practices could have a significant impact on the environment. The global sneaker market is valued at $62bn and is expected to reach $90bn by the end of 2022. And Nike, for example, typically sells 25 pairs of sneakers every second. Meanwhile, creating a typical pair of running shoes generates 13.6kg of carbon dioxide emissions, according to one study by MIT. This is equivalent to keeping a 100-watt light bulb on for one week. Consumers often don’t think about the green credentials of a pair of shoes. Interestingly, most of those emissions come from the manufacturing process rather than from sourcing and using the raw materials. The MIT researchers found that more than two-thirds of a running shoe’s carbon impact occurs during manufacturing, especially as most shoes are made in China where coal is the dominant source of electricity. The importance of the manufacturing process has not been overlooked by Allbirds. “Our tree fibers are sourced from South African farms that minimize fertilizer and rely on rainfall, not irrigation,” the company writes. “Compared to traditional materials like cotton, it uses 95% less water and cuts our carbon footprint in half.” In addition, the sourcing of materials complies with strict standards to protect forests and the animals and people who depend on them. Many traditional sneaker makers such as Nike and Adidas are also working hard to improve the environmental credentials of their shoes. Nike has created a new material called Flyleather by combining waste leather cast-offs with synthetics. Nike Flyleather claims to reduce water use by 90% and has an 80% smaller carbon footprint than traditional leather manufacturing. And Adidas has sold more than one million pairs of shoes that are 95% made from plastic debris found in the ocean. Adidas uses marine waste collected from the Maldives, with an average of 11 plastic bottles used per pair, with the plastic turned into laces, heel webbing and lining. Adidas has tapped into the increasing concern about the amount of plastic waste in the oceans. 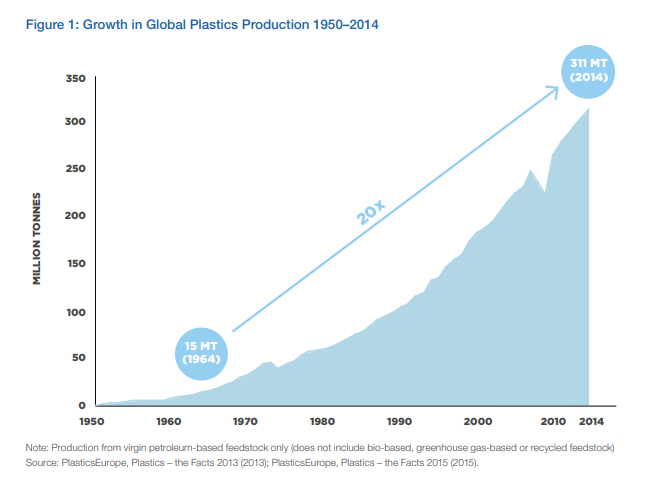 Plastics production has surged over the past 50 years, from 15 million tonnes in 1964 to 311 million tonnes in 2014. And it is expected to double again over the next 20 years, according to The New Plastics Economy Report. Much of this plastic ends up in the oceans, which are expected to contain more plastics than fish by weight by 2050, unless the world makes significant changes now. And the sneakers we choose to buy could be just one way of starting to reverse that trend.